Congratulations! You’re engaged! I bet it was simply beautiful and now you’re a heady mix of overjoyed and overwhelmed. In this crazy-busy world of constant movement, chances are that you and your fiancé come from different places. Should you marry in his home town or yours? Or should you break with tradition entirely and try something fabulous overseas. A destination wedding sounds like a brilliant idea in theory, but bringing it to fruition brings a unique set of challenges to the busy, modern bride. Hello, I’m Nic, and I very recently returned from our destination wedding in Hoi An, Vietnam where Hoi An Events managed our week for us. I love weddings and love to travel; the thought of combining these two singularly awesome activities into an epic confluence of love, champagne and sunsets appealed to my fiancé and I massively. So here’s a little of what I learned. It sounds fun, but is a destination wedding actually for you? You and your fiancé will both have your own ideas about what constitutes a brilliant wedding. You’ll be informed by your experience of recent weddings and what was ‘normal’ growing up. You’ll likely have ideas about what you’ve always wanted for yours. If I could give one single piece of advice before you get too far down the destination road: try to have an open mind. If you’ve dreamed about a shabby-chic, country barn wedding your whole life, you can rule out most of South East Asia. Likewise, his dream to say “I Do” at his university cricket club rules out heading overseas! Also, if it’s important to you to have certain groups there (your school friends, his uni mates etc), or if it’s essential to have your elderly grandparents sitting in the front row, a destination wedding may not work. As we all know, weddings are as much about the ‘who’ as the ‘where’ so bear in mind that it’s possible that portions of your guest list that would otherwise have attended were you to get married at home, may not make it. This isn’t personal, life is hectic and international travel takes time and money. Depending on the size of your guest list, and purely to save yourself a lot of time and energy, I would suggest you go chose a destination that ‘does this kind of thing’. Places where tourism is established, there’s a venue that cater to what you’re looking for, plenty for your guests to do when they aren’t at the ceremony, where there’s a (preferably English speaking) doctor, where the food is decent, accommodation is clean and affordable, you don’t need a laundry list of vaccines before you travel and you can show your guests good fun without needing to handhold the entire time. Play to the crowd here. We thought Hoi An totally nailed this for us. Travel – Is it easily accessible? How many connecting flights/transfers does it take to reach the end point? Will some guests end up travelling disproportionately further than others? This may or may not sway you one way of the other, you’ll just have to remember to show big love to the unlucky few who end up with an 18 hour commute (New York is a long way from Hoi An …). Don’t forget about people’s journey to/from your destination and try to be kind in not scheduling the welcome dinner 20 mins after your mates touch down from Sydney. Legally wed – Depending where you’re from and who you’re marrying, chances are high your destination wedding won’t be recognised at law. So, you’ll need to do the registry thing at home, either before or after your destination wedding. It’s up to you how large or small an affair you make this, just remember to look into what’s required from a timing perspective in order to link this small (but very necessary detail) to the big day. You don’t want to have your huge hurrah in Hoi An and then wait 9 months for the registry queue to clear. Incorporate this aspect to your overall plan, it’s no less crucial. 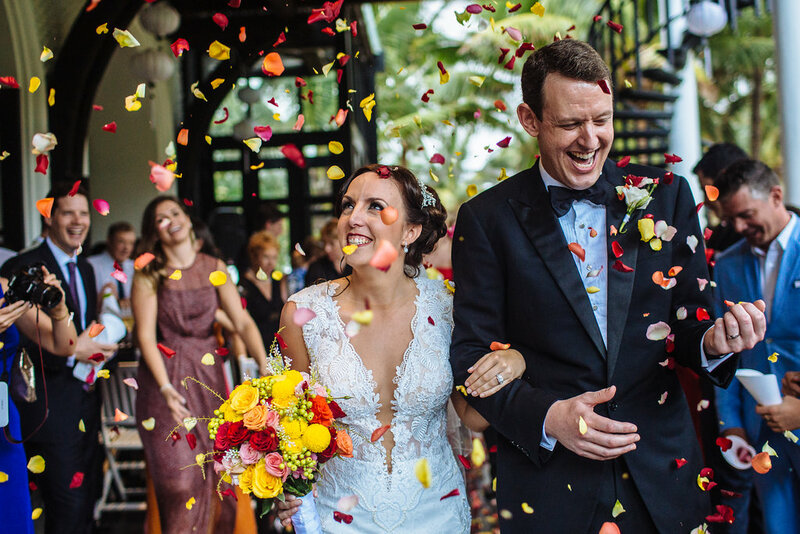 Given all this thinking you’ve done about your destination, the time of year and the inevitable compromises you know you might need to make to pull off your dream – you’ll have a pretty good idea of the kind of wedding you want by now. Much the same as at home, a lot of the drama or relative peace associated with the planning now rests on your choice of venue. To the extent you have the time and the budget to do so, I cannot recommend strongly enough that you head out with your Fiancé, to see the venue and meet the people who will help you plan your day. Rooms look drastically different in real life to on camera, and it sounds obvious, but planning the event where we had visited the space and seen things up close it was a nicer, calmer experience all round. (As a side bar, I also found that having my future hubby in the place where it was all going to happen helped him focus on a few details/decisions we’d been putting off … and that it was just a totally mushy, loved up holiday. Bonus). It might be worth considering here how much time you have to devote to the planning process, and honestly, how much you care. Do you enjoy this kind of thing? Or is it more about you and your man, than the colour of the table cloth? Again, depending what you decide venue wise will directly impact how much time you have to spend on the planning. Creative types might love the idea of a marquee on the beach where absolutely everything is sourced locally and each item requires thoughtfulness and customising. Others who are less detail orientated might prefer a hotel/villa that can roll out a wedding package that can then be tailored to suit. Regardless of what you decide, your wedding planner can help! Time differences, cultural differences, and basic language barriers all stand between you and the day running smoothly. Assuming you don’t end up in the hills of Bhutan, chances are good there are folk on the ground who do this kind of thing for a living and are very good at it. Use them to their full potential; they’ll save you time, frustration and offer tips and suggestions for a part of the world they know well and love. A good planner will help even the most ambivalent bride get excited. When communicating with your planner (especially if you aren’t able to head out beforehand) be as specific and precise as you can. Don’t take ‘western’ concepts for granted, for example, I found there to be a surprisingly large variation between what is considered ‘standard’ at weddings even across the UK, the US and Australia. You know what they say about ‘assuming’ and you don’t want to arrive for your wedding week to find that when you said ‘a few canapés with cocktail might be nice’ the venue have a buffet large enough to feed a small town or that you’ve didn’t think you needed to tell people you plan to have speeches, and there’s no microphone and speakers set up for this, or time allocated between courses. Again, your wedding planner will help avoid this, but they can’t manage it, if you don’t tell them. You’ll become very familiar with your destination, and amazed and frustrated in equal parts at how all of a sudden you’re the Lonely Planet, Trip Advisor, Government Advisory board, vaccinations expert and general agony aunt, all at once for your guests. Rightly or wrongly, I felt a huge sense of responsibility to ensure that people who had so kindly given up their time and hard earned cash to join us, had a brilliant holiday. Try to mitigate some of this stress by planning ahead, whilst trying to deflect what you can. It will be helpful (and Hoi An Events were all over this) to have a list of restaurants to try, places to visit, sites to see, hotels to stay at, tips re bartering/market shopping, tailor recommendations – you name it. You will want to spend time with your friends and family once you get where you’re going, not spend time on your phone texting second-cousin Timmy a good place for lunch. Things always go wrong at weddings, but for some reason, when a whole bunch of people are outside of their comfort zone and in unfamiliar territory, a destination wedding make these little mishaps seem all the more acute. It won’t be your fault. Chances are you couldn’t have avoided it. And for all the planning and preparation in the world you’ve done up until that point, try not to make it your responsibility to solve. Destination weddings seem to bring a heightened sense of excitement and fun, with the correspondingly spectacular difficulties when things go wrong. Try and expect something will happen. Plan for what you can (an understanding of local medical facilities is my biggest tip here) and try not to let it bring you down. Something will happen, and whatever happens to you will likely be so unexpected and bizarre, you will end up laughing about it. The wedding vendor market is much smaller when you head outside the capital cities and even smaller when you are trying to incorporate foreign concepts to a different country. You won’t have as many options for flowers/band/hair and make-up as you would at home. Here’s the good news: this is ok. Enjoy the time saved, relax and accept this as part of destination fun. One added benefit of the tropical destinations is the choice of amazing seasonal and colourful flowers, for a tenth of what they cost back home. Your bouquet will be blooming lovely! But not if you’ve always wanted pale pink peonies. Compromise. It also makes the planning process so much simpler and alleviates a lot of self-imposed pressure. Only one type of dinner wear? Easy! Have this cake or none? A no brainer. I know one London bride who spent 7 weekends in a row ‘ducking into’ other people’s weddings to hear bands play before she was happy to choose one – by choosing a destination, with its inherently limited options, you’re able to crack on with other things. Hoi An Events helped us by narrowing our choices down to a select few and we were able to decide quickly, and move on. This was freeing, and very much appreciated (it helped that they are brilliant at what they do, have the market cornered, and have excellent taste). I’m in two minds on this one, so will make comments brief: a hundred layers of lace, tulle and beading won’t be all that comfortable in 98% humidity. You will also need to carry your dress with you (on you, at all times!) when you travel to your destination, so bear in mind a huge, heavy dress won’t fit most airline hanger closets. But on the other hand, it’s the only day you get to properly push the boat out and one of the best things about getting married is finding a dress you love, that you feel beautiful in, that you can’t wait to show your man. So, sod the climate and the practicalities and get what makes you feel special. 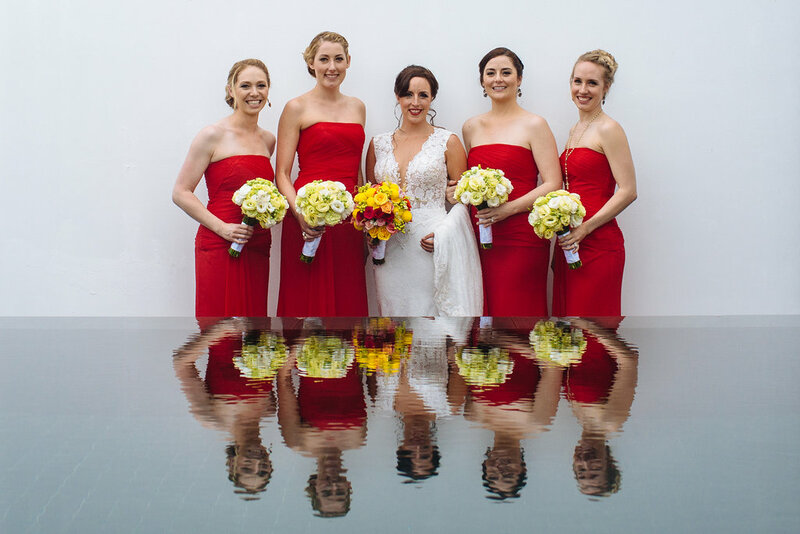 You just might be really sweaty, so bridesmaids at the ready with tissue and have your reception in air-con! Be mindful of the men though: a tweed three piece does not a happy groom make when he’s standing in a puddle. Finally, as with any wedding, give your guests a steer as to how you’d like them to be dressed, this is helpful for everyone given most will be unfamiliar with the setting, the climate and your expectation for the day. 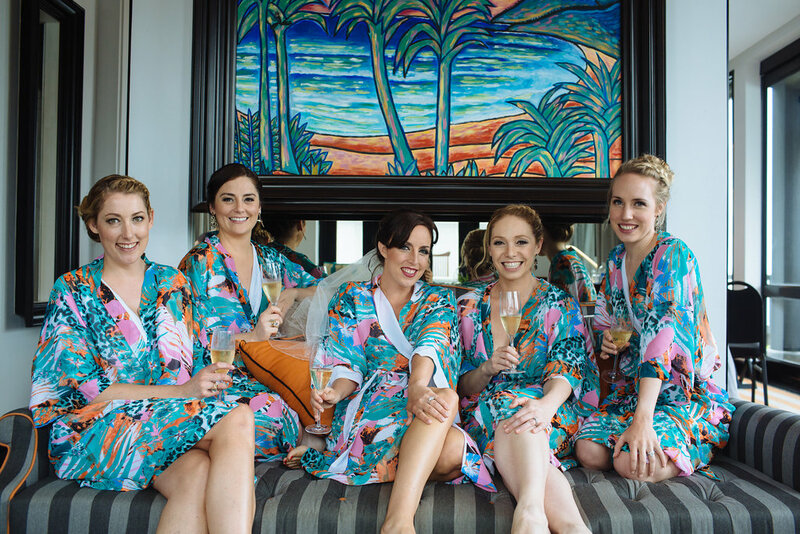 Given guests have travelled, and how trends in weddings seem to be evolving these days, you might want to think about bookending the ceremony itself with a few additional events. Welcome dinners, recovery brunches, night before and day after events are the most common and can be a good way for your guests to get to know each other as well as for you as a couple to spend some a bit more quality time with your guests given the day itself moves at lightening pace. Hoi An Events can help with all of this. I’m going to say up front here that a destination wedding is not necessarily cheaper. Like any wedding at home, there’s a cheaper way and a more expensive way to do things, and all of this should be considered right up top when you’re deciding which destination and which venue. My fiancé thought we were ‘quids in’ and whilst we absolutely couldn’t have had a like-for-like ceremony at home, for the same cost, it wasn’t 50c beers, either. Helpful to set those expectations early in the process to avoid arguments later. Also, the one tip I would offer is that you’ll be choosing your destination because it’s beautiful and you love it there – whether its letting the natural beauty speak for itself, or harnessing local flavours, you will save money by playing to your destination, rather than trying to change it. To honeymoon or just head home? A note on the days after… You guys will have had a hugely busy time. Combine the usual wedding stress, with a bit of destination wedding intensity, and you’ll be totally knackered. Don’t be afraid to take extra time to mini-moon, honeymoon or maxi-moon! Whatever you do, you guys will want to chill with each other, but you may not realise that you’ll need to. Be sure to allot time for this post ceremony. It really is the best fun, and something you’ll never forget.